Dysfunction in Contract Drafting: The Causes and a Cure, 15 Tennessee Journal of Business Law 317 (2014). It’s Time to Get Rid of the “Successors and Assigns” Provision, The Advocate, June/July 2013. Asia: Different Contracts, Different Cultures, Asian Legal Business, January 2013. The Illusion of Quality in Contract Drafting, New York Law Journal, July 17, 2012 (with Tim Allen). Making a Mess of Ambiguity: Lessons from the Third Circuit’s Opinion in Meyer v. CUNA Mutual Insurance Society, Business Law Today, Nov. 20, 2011. Whittling Away at Duty of Good Faith, The Recorder, June 28, 2011. The New Associate and the Future of Contract Drafting, New York Law Journal, Apr. 1, 2011. The AAA Standard Arbitration Clause: Room for Improvement, New York Law Journal, Mar 9, 2010. 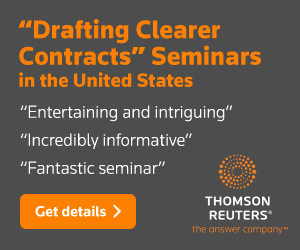 Retooling Your Contract Process for the Downturn, New York Law Journal, Feb. 19, 2009. Dysfunctional Drafting, National Law Journal, Sept. 8, 2008. 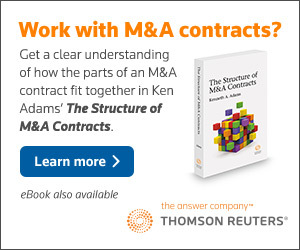 Merger Pacts: Contract Drafting, Cerberus Litigation, New York Law Journal, Feb. 19, 2008. Transitioning Your Contract Process from the Artistic to the Industrial, ACC Docket, Dec. 2007 (with Brian Quinn). Making Sense of “Shall,” New York Law Journal, Oct. 18, 2007. What Does “Material” Mean?, Deal Lawyers, Sept.–Oct. 2007 (is the third article in the issue). Behind the Scenes of the Comma Dispute, Globe and Mail, Aug. 28, 2007. Revisiting Materiality, New York Law Journal, Aug. 16, 2007. “Wordsmithing,” New York Law Journal, June 21, 2007. Sending Contracts Offshore, New York Law Journal, Apr. 19, 2007. Wiki, Anyone?, New York Law Journal, Feb. 15, 2007 (on using wikis in the contract-drafting process). Revisiting the Ambiguity of “And” and “Or” in Legal Drafting, 80 St. John’s Law Review 1167 (2006) (with Alan S. Kaye) (superseded by what’s in A Manual of Style for Contract Drafting). How to Avoid Contractual Train Wrecks, National Law Journal, Nov. 6, 2006 (on addressing pre-closing knowledge of inaccurate representations). Copyright and the Contract Drafter, New York Law Journal, Aug. 23, 2006. Teaching Contract Drafting: The Two Elephants in the Room, 14 Perspectives: Teaching Legal Research and Writing 92 (2006). Can Lawyers Be Trained in Contract Drafting?, The Lawyers Weekly, Mar. 17, 2006. Debunking Urban Legends, New York Law Journal, Dec. 2, 2005. Translating English Language Contracts, Bulletin of the Institute of Translation & Interpreting, Sept.–Oct. 2004. Understanding “Best Efforts” and Its Variants, Practical Lawyer, Aug. 2004. Drafting a New Day: Who Needs that Recital of Consideration?, Business Law Today, Mar.–Apr. 2003. Drafting a Contract, New York Law Journal, Sept. 27, 2002. Legal Usage in Drafting Corporate Resolutions, Practical Lawyer, Sept. 2002. The New New Rules of Drafting (Part One), Michigan Bar Journal, July 2002. The New New Rules of Drafting (Part Two), Michigan Bar Journal, Aug. 2002. Drafting Matters, New York Law Journal, July 5, 2002.